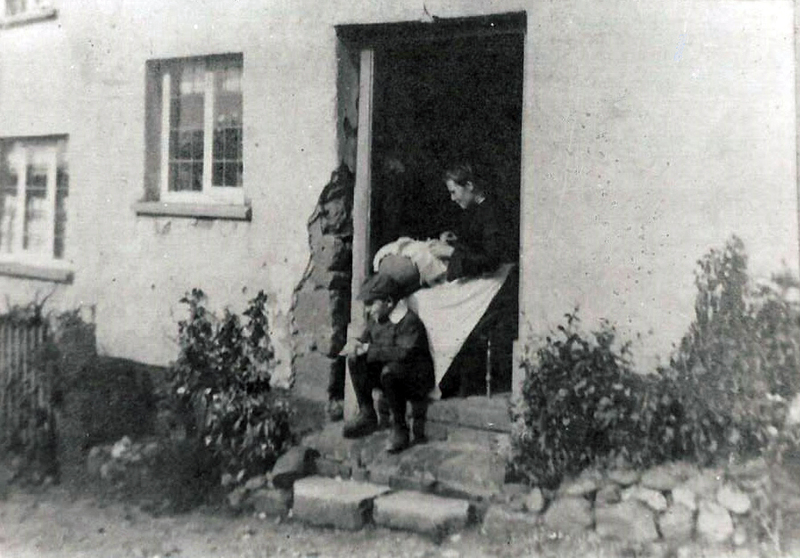 Mrs. Snell 1910 Conway Cottage,Maunders Hill. Lace making in Otterton has been a long established cottage industry. Indeed Polwhele, the well known historian says in 1790 “females of the village are entirely manufacturers of a coarse kind of thread lace”, When the craft first started is unknown, but it is said it was brought over by Flemish refugees about 1600. Lace making is mentioned on a gravestone in Honiton Churchyard in 1617. (Michael Harrison). The craft was the most important occupation – and moneymaker- of the ladies and girls in the towns and villages of South East Devon. It augmented the income for village families especially during the hard times of the agricultural depressions of the 19th and early 20th centuries. 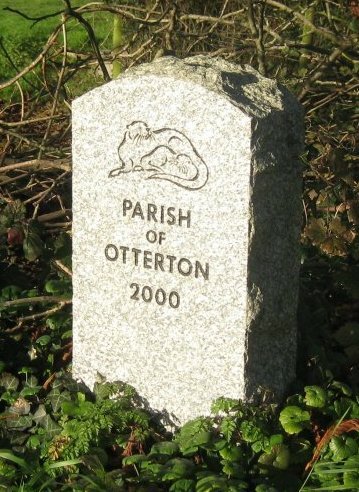 According to the 1841 Census at least 240 females, both young and old, in Otterton were engaged in this delicate work. In 1823 Mr.& Mrs Lawrence opened a Lace Shop somewhere in the village. 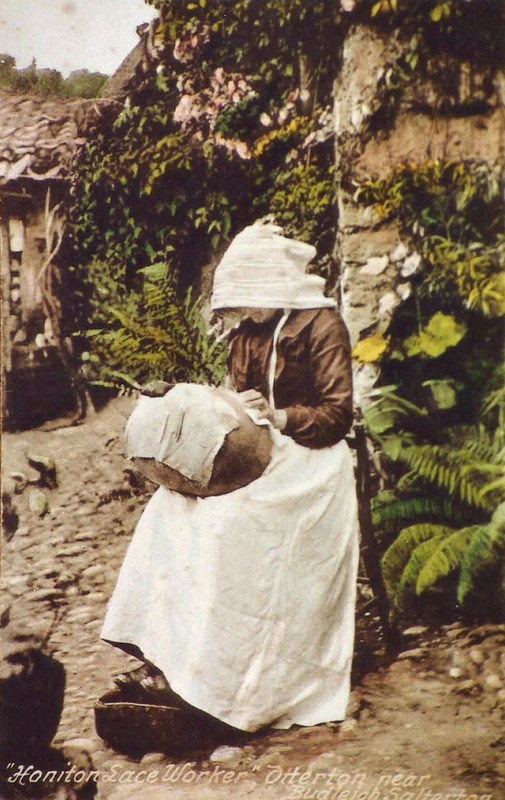 Sprigs of Honiton Lace were bought from neighbouring villagers. They moved to Sidmouth about 1830 which became their Headquarters. By the 1850’s Mr.Stephens of Sidmouth was collecting finished articles and in 1852 he set up the Otterton Lace Institution. On the 5th. July 1853, 130 lady members paraded through the village to the Church beneath “5 splendid arches with flags flying....thousands? of spectators congregated to witness the scene. The Church was crowded to excess”. Tea was provided by Messrs. Stephens & Co. of Sidmouth for 703 lacemakers afterwards on the Green, followed by sports and dancing. 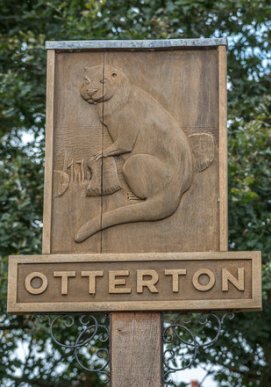 By 1857 Robert Bucknell had opened a shop in Otterton dealing in lace and in January 1860 was buying the lease of 2acres of land from William Wood of the Newton Poppleford Silk Mill. These were cottages at the corner of Pig Street ie. Hayes Lane and Behind Hayes. About this time Bucknell moved to East Budleigh off High Street near the Church and is known to be doing business with Wood at the Silk Mill. He was still dealing there in 1886. Also in 1857 William and Mary Pratt had opened a shop dealing in lace in “The Lawn”. The Pratt family continued lace trading at least to 1939. By 1861 Miss Catherine Mary Pidgeon had opened a shop in Brook House, Fore Street as a Draper and Honiton Lace Manufacturer. Nearby at Jane Prince’s shop at No.3 The Green she was also dealing in lace being also a General Store. Both the Pratts and Miss Pidgeon were in business to 1914 when they were joined by Mrs. Mary Ann Gorman lace dealing at Spinning Wheel Cottage, Crosstrees. Miss Pidgeon, who attended at Salem Chapel, died in 1927 and Mrs. Gorman closed before 1939. Mention should be made of Miss Sarah Harding, then Miss Eliza Langmead who assisted Miss Catherine Pidgeon. Miss Dorothy Miller assisted at Pratts shop and her daughter Maureen continues today in the exquisite art of lacemaking in Otterton. Notes:- Among the various varieties of Euonymus shrubs that may be growing in our gardens is the Common Spindle Tree (Euonymus Europaeus). You may be surprised to find examples growing in the wild (some up to 20 feet in height) in the Otterton hedgerows. This was a valuable tree in years gone by as it provided a tough wood that did not splinter and was used for making bobbins for the lace-making industry in the district – also for meat skewers.